Tennis Elbow also known as Lateral Epicondylitis is caused by overuse. Pain can be felt on the outside of the elbow and occasionally in the forearm or wrist. Tennis players are not the only ones susceptible to Tennis Elbow, any sport or activity with similar repetitive motions can trigger Tennis Elbow. 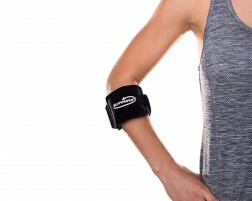 A brace on the upper forearm with compression will help relieve symptoms of Tennis Elbow. Combining rest, a brace for tennis elbow, physical therapy and cold therapy is a good start on treating Tennis Elbow. 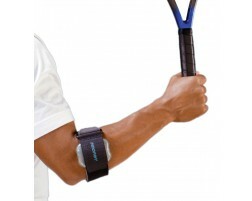 Need help selecting a support for tennis elbow? Use our Brace Advisor, for recommendations based on your level of activity and whether you have existing issues with tennis elbow or are looking for prevention. Lateral epicondylitis, commonly known as tennis elbow, is not limited to tennis players. The backhand swing in tennis can strain the muscles and tendons of the elbow in a way that leads to tennis elbow. But many other types of repetitive activities can also lead to tennis elbow: painting with a brush or roller, running a chain saw, and using many types of hand tools. Any activities that repeatedly stress the same forearm muscles can cause symptoms of tennis elbow, which include inflammation, soreness, or pain on the outside of the upper arm near the elbow. Good warm up exercises before repetitive activity is a good habit for preventing any injury, and wearing a brace can really help prevent tennis elbow.